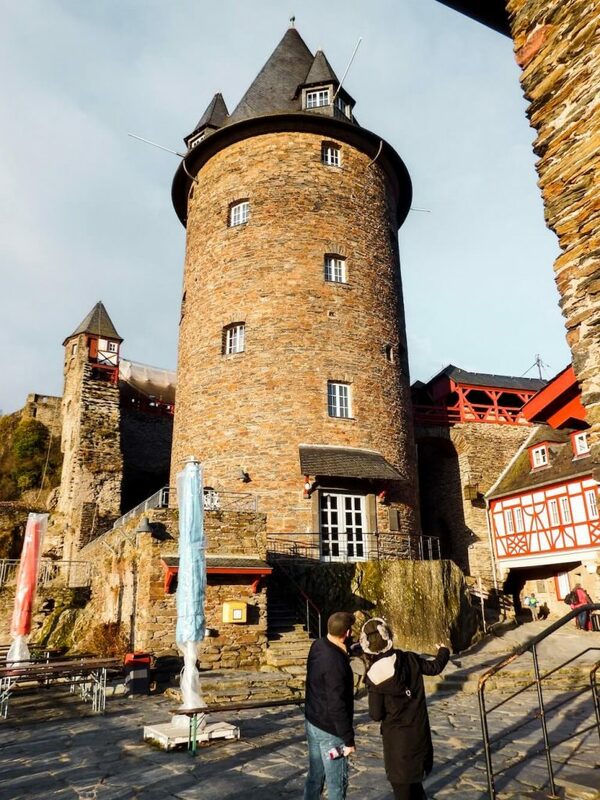 The Upper Middle Rhine Valley (Oberes-Mittelrheintal in German) is the region along the River Rhine that stretches for 65-km between the city of Koblenz and the towns of Bingen and Rüdesheim am Rhein in Germany. This UNESCO World Heritage site region is renowned for its historical towns, steep vineyards, and hill-top castles. Whether you cruise, or drive along the spellbinding Rhine River, you’ll feel transported to another time. May through Mid-October is the most popular time to visit the Rhine Gorge. We visited this region by car in early March 2017. Many restaurants were closed, which made it challenging to find a place to eat. Also, many of the castles were either closed for the season or were only open on certain days. Nonetheless, it was fun to experience the towns, almost entirely to ourselves. We visited again in mid-May 2017 by train and a river cruise, and it was spellbinding. There were definitely more people, but it wasn’t busy or crowded. It was wonderful to hike through the bright green landscape and enjoy the wine-making villages, no longer in their winter slumber. 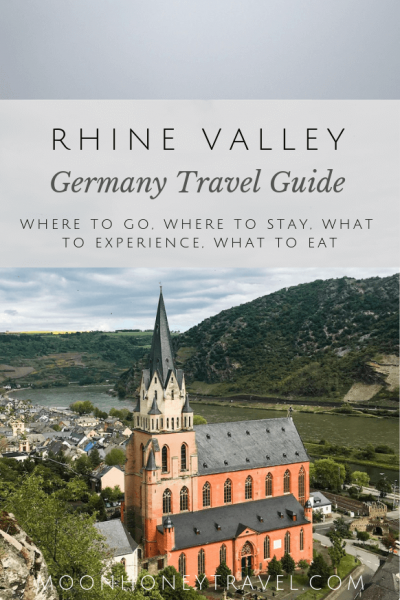 There are a lot of synonymous terms that refer to the Upper Middle Rhine Valley region, which can be confusing when you start planning your trip. So, we outlined the terms below to make it easier. Rhein (Rhine) – The European river that originates in the Swiss Alps, flows through Germany and empties into the North Sea in the Netherlands. The river serves as an important trade route. Mittelrhein (Middle Rhine) – The region stretching between Bonn and Bingen. The term is also used to describe this geographical wine region. Romantischer Rhein (Romantic Rhine) – The region stretching between the beginning of the Siebengebirge in the North (Around Remagen and Unkel) and Rüdesheim am Rhein in the south. The Romantic Rhine encompasses the Rhine Gorge. Oberes-Mittelrheintal (Upper Middle Rhine Valley) – The region stretching between Koblenz and Bingen. The Upper Middle Rhine Valley is also a UNESCO World Heritage Site (2002). Rhine Gorge – another name for the region between Koblenz and Bingen. Lorelei (Loreley) Rock – a steep slate rock on the Rhine Gorge in Sankt Goarshausen. 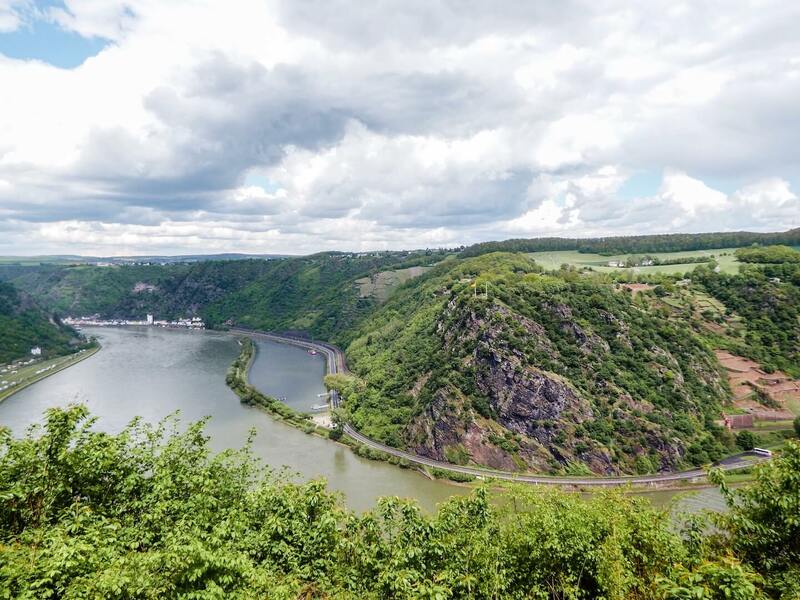 The legend of the Loreley originated in the early 1800s when German author Clemens Brentano wrote his ballad Zu Bacharach am Rheine, which tells the tragic tale of the woman Lore Lay. After being betrayed by her lover, and then later accused of bewitching men, she throws herself into the Rhine. Twenty years later, Heinrich Heine adapted the tale in his “Die Lorelei,” which transforms Lore Lay into a siren-like figure, who sits on the cliff and distracts shipmen with her beauty and voice. The result is their impending death, as they crash into the cliffs below. The Loreley has inspired the composition of various music, film and literary works. Rheinland-Pfalz (Rhineland-Palatinate) – The German State in which the Upper Middle Rhine region is located. Rheingau – this is one of the 13 designated wine regions (Weinbaugebiete) in Germany, located in the state of Hessen. 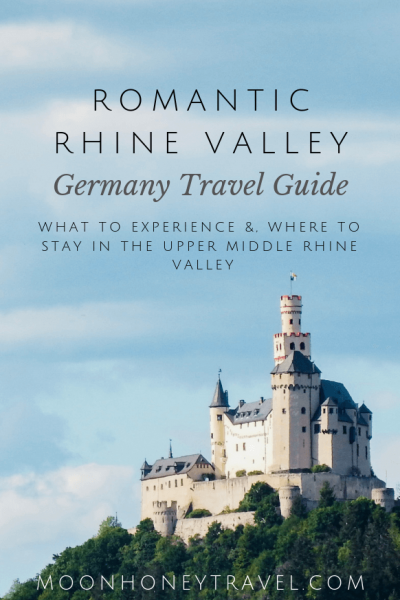 You might hear this term, because Rüdesheim am Rhein, the town that marks the southern border of the Romantic Rhine, is in the Rheingau region. Bingen, the town directly across the river from Rüdesheim am Rhein, is in the state of Rheinland-Pfalz (Rhineland-Palatinate). als viel Gelt und Gut. than a lot of money and possessions. 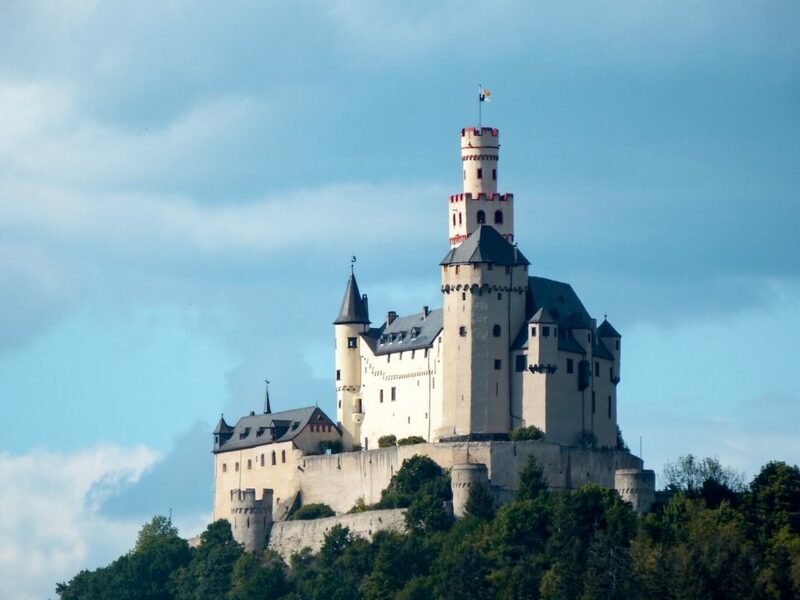 There are several medieval castles along the Rhine that have been converted into hotels and hostels. One such converted castle is Burg Stahleck in Bacharach. Serving as a youth hostel, this magical place sits high above the town and has a breathtaking view of the river. Watching the sunrise from the castle was an unforgettable experience. In the morning, we explored the castle vineyard and drove into town. 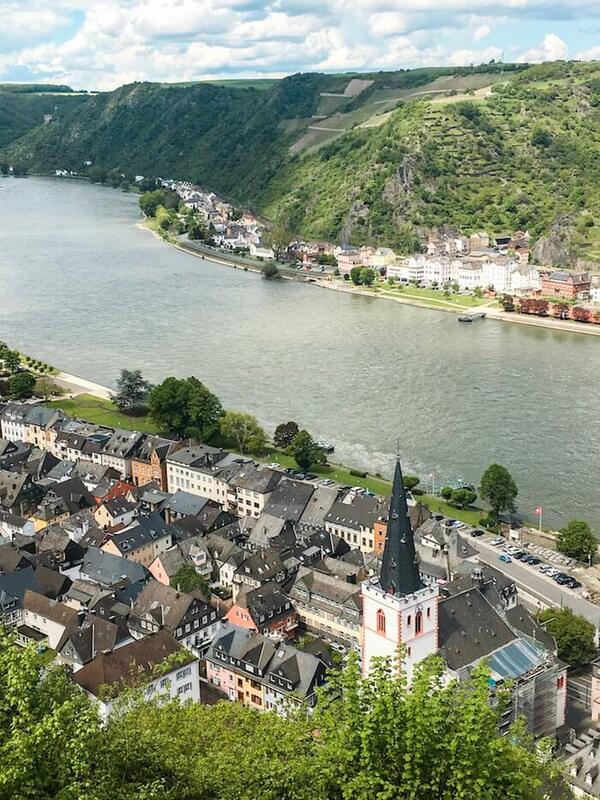 Bacharach was one of our favorite destinations in the Rhine Gorge. 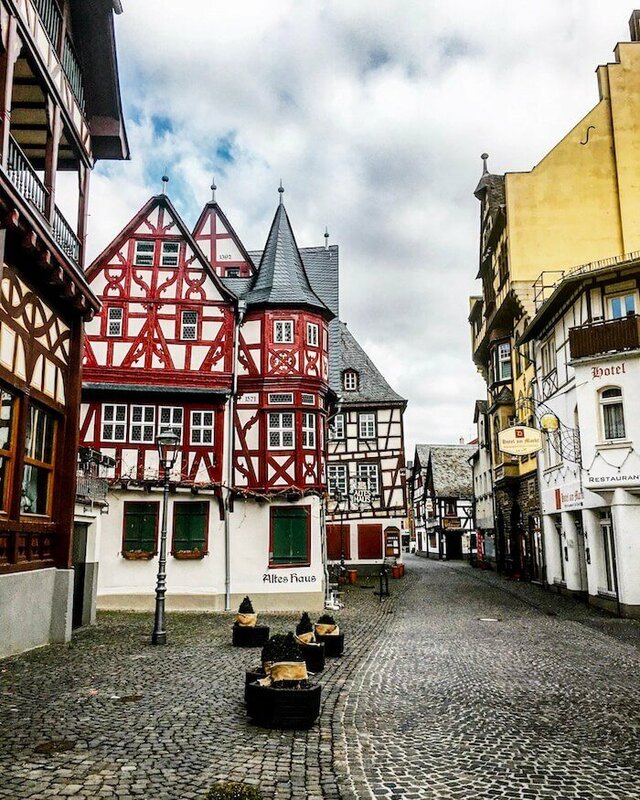 Cobblestone streets, slanted wooden frames, half-timbered houses, a gothic church ruin (Wernerkapelle), and quaint wine taverns contribute to the fairy tale appeal of this medieval town. During our second trip to the Rhine Gorge, we stayed in Burg Reichenstein in the town of Trechtingshausen. This beautiful castle hotel has an in-house restaurant and museum. Upon arrival, we hiked part of the Rhine Castle Trail to the neighboring castle, Burg Rheinstein, and hiked back along the river. The next morning, we enjoyed a delightfully presented breakfast in the castle restaurant Puricelli. 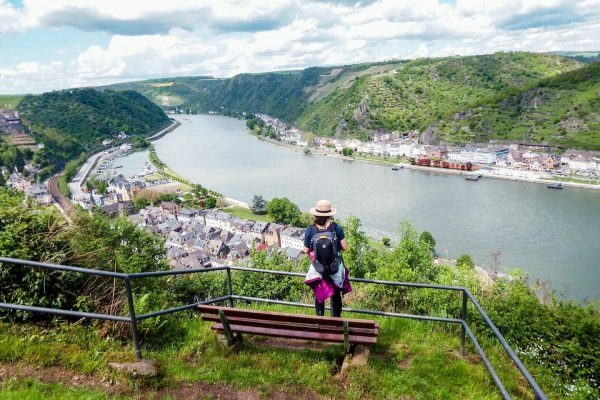 There are two main hiking trails in the Rhine Gorge: RheinSteig on the right side of the Rhine and RheinBurgenWeg (Rhine Castle Trail) on the left side of the Rhine. 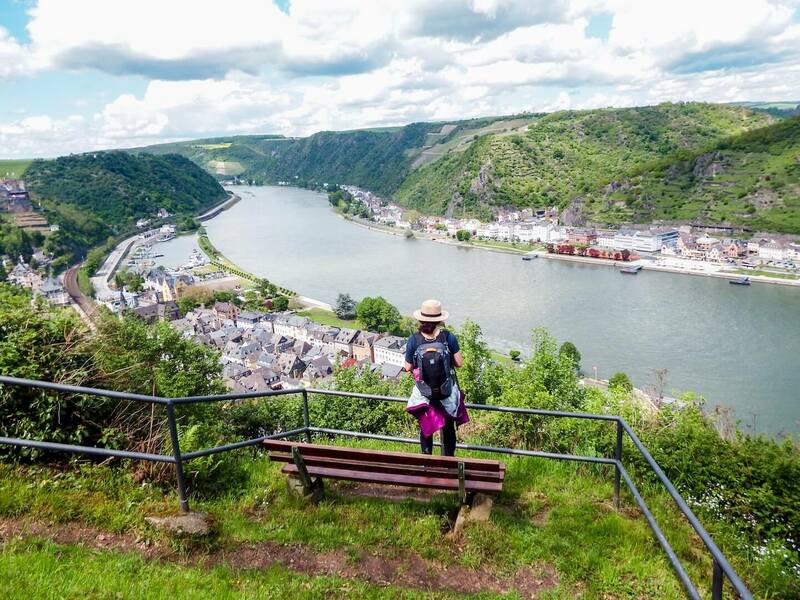 The RheinBurgenWeg is a 200-km trail from Remagen (north of Koblenz) to Bingen, that offers hikers unbeatable views of the Rhine Valley. The trail is divided into 13 stages. Stages 1 through 6 are in the Lower Middle Rhine Valley (Unteres Mittelrheintal ). Stages 7 through 13 are in the Upper Middle Rhine Valley (Oberes Mittelrheintal). We hiked a part of Stage 13, from Burg Reichenstein to Burg Rheinstein (these are two different castles, with very similar names) in the town of Trechtingshausen, which offers fairy-tale views of both castles and the surrounding vineyards. Because we were staying at Burg Reichenstein, we wanted to do a loop. So, we hiked the RheinBurgenWeg to Burg Rheinstein, and then descended to the Rhine, and took the footpath along the river back to Burg Reichenstein. This hike took 1 hr and 40 min, with plenty of stops to enjoy the vistas. We also hiked Stage 10, between the towns of Oberwesel and Sankt Goar. For more info and photos, read our blog post about Stage 10 of the Rhine Castle Trail. Cruising the Rhine provides a rich vantage point of both banks of the river. Traveling by boat past hilltop castles, small wine-making towns, and steep vineyards is a must-do, especially on a beautiful day. We recommend traveling in the direction of Koblenz (as opposed to Rüdesheim) because it’s faster since you’re traveling with the current. 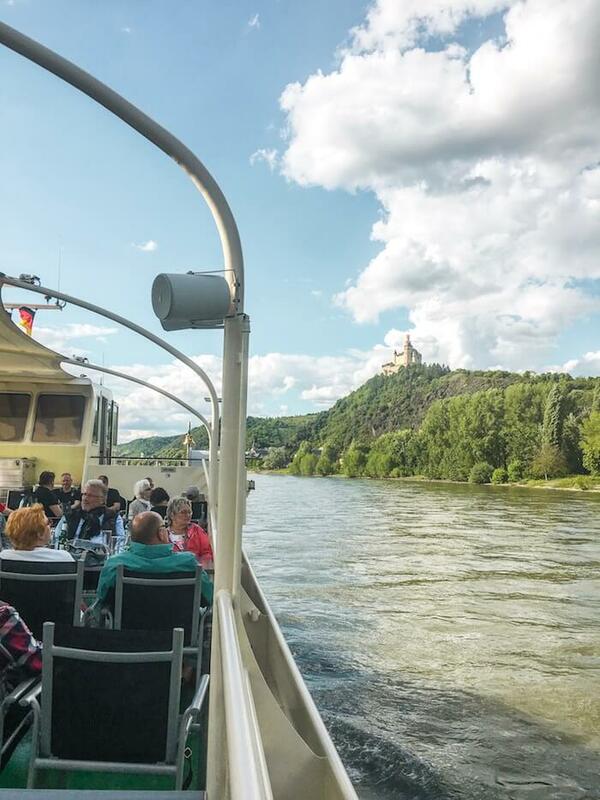 There are several river cruise operators that take you to different parts of the Rhine Gorge. We started our day in Bingen and embarked on the KD River Cruise. We chose this operator because they have several different boats running during the day, allowing you to jump off at one destination, and hop on another boat, one hour, or several hours later. Ticket Purchase. You can purchase your ticket on the same day of travel. There’s a KD Ticket Office directly located across from every KD arrival/departure dock. Ticket Discount. 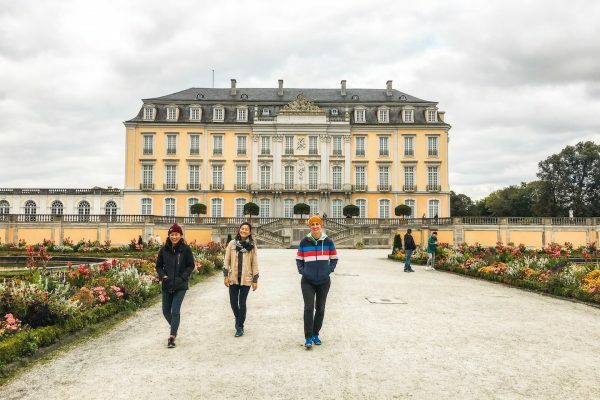 KD offers discounts for Deutsche Bahn ticket-holders, students (27 and under), seniors, and children. Ticket Transfer. If you intend to hop off the ship and hop back on another KD vessel at another time (or place), you need to secure a transfer ticket. We received the transfer ticket from the KD Ticket Office, after disembarking. Timetable. The timetable varies by season. Pick up a Fahrplan from the KD Ticket Office to help plan your day. Also, ask the ticket sales attendant if all the scheduled ships (as delineated in the Fahrplan) are running that day. 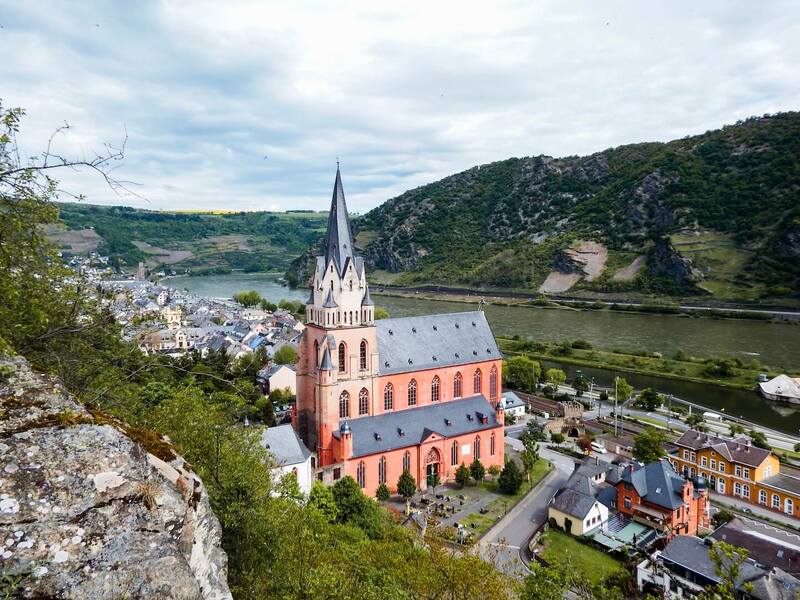 Located on the left bank of the River Rhine, Bacharach is an enchanting wine-growing town in the Rhine Gorge. Above the town, you’ll see Burg Stahleck, a medieval castle that now serves as a youth hostel. 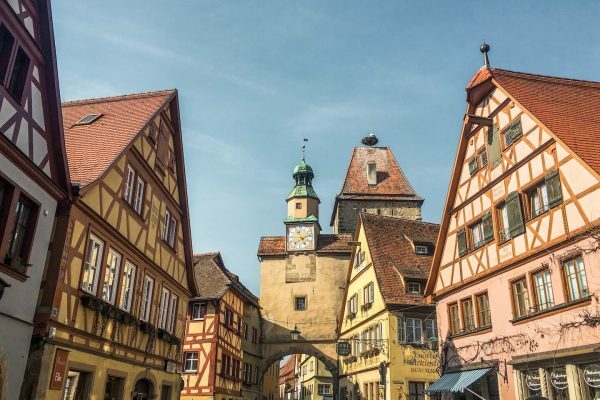 Lantern-lit streets, slanted wooden frames, half-timbered houses, a gothic church ruin (Wernerkapelle), and quaint wine taverns contribute to the fairy tale appeal of this medieval town. Make sure to check out the parish church of St. Peter (Pfarrkirche St. Peter), a great representation of German romanesque and early French gothic architecture. 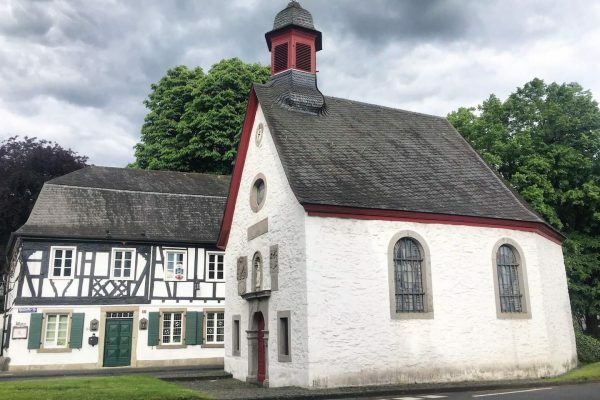 And before you leave, grab a bite to eat at the historical Altes Haus (“Old House”). This original half-timbered house with four gables dates back to 1368. Rüdesheim am Rhein is a very popular destination in the Upper Middle Rhine Valley. When we visited this wine-making town in March, storefronts were being repaired and prepared for the season, and we had the luxury of exploring the town by ourselves. If you find yourself here in high season, this town will likely be overrun by cruise passengers and bus tourists. 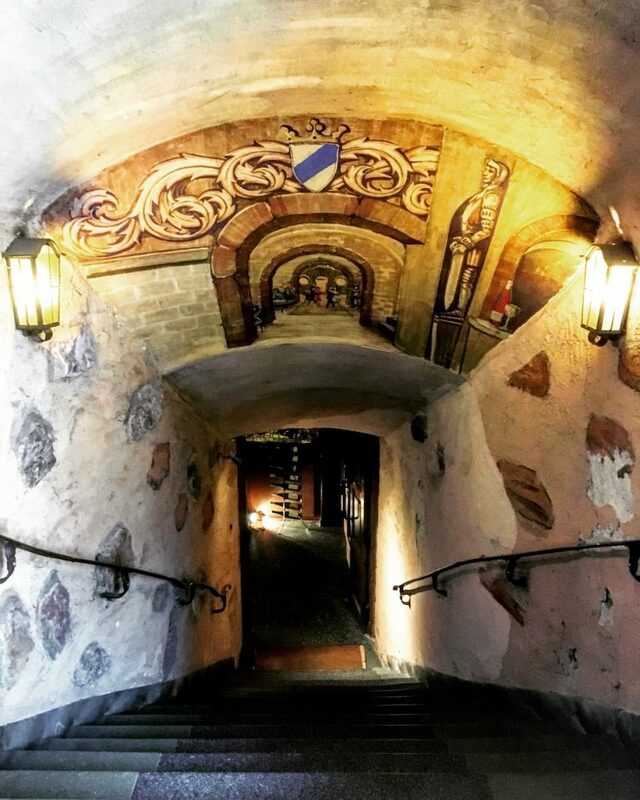 We enjoyed a free wine-tasting in a 17th-century wine cellar: Felsenkeller, though it was unabashedly set up for tourists (you’ll see signs in Japanese and Chinese). After, we strolled down (the overrated) Drosselgasse, which is a narrow street filled with restaurants, shops, and historic buildings. Riesling – regional white wine. When selecting a Riesling, you have several options: trocken (dry), halbtrocken (half-dry), feinherb (similar to halbtrocken, though not clearly defined), and lieblich (sweeter). Himmel un Äd – translates as “heaven (or sky) and earth”. The main ingredients are apples (from the sky) and potatoes (from the earth), as well as black pudding and apple sauce. Sauerbraten – translates as “sour roast.” Sauerbraten is made by marinating a beef roast in a sour-sweet marinade for 2 to 3 days before browning it. Next, the meat simmers in the marinade for several hours, which makes it very tender. Halve Hahn – translates as “half a chicken.” This is somewhat of a joke, as there is no chicken in this dish. Halve Hahn is simply a rye roll, halved and topped with Gouda cheese. Mustard, pickles and onions are generally served on the side. Reibekuchen (also called Kartoffelpuffer) – translates as “grated cakes.” It’s essentially a deeply fried potato pancakes made with potatoes, onions and eggs. It’s popular to eat these on the street at Christmas markets, fairs and sports events. They’re delicious, but don’t over do it. You’ll die. Flammkuchen – Alsatian pizza. Thin rectangular dough topped with various vegetables, cheeses and meats (no tomato sauce). Rinderroulade – a meat dish which consists of bacon and onions, wrapped in a thin slice of beef, and then cooked. The meat is characteristically tender and soft. The dish is presented with usually 1-2 side dishes and gravy over the meat. There are some affiliate links in this travel guide. If you make a booking or a purchase using the links, we’ll get a small commission at no extra cost to you. It’s how we cover the costs of running the blog! Read these helpful posts next!